Yesterday I travelled up to Sendai with my friend and Iaido colleague K san for the All Japan Iaido Championships. This is an annual event that changes venue each year. This year’s host city, Sendai, lies about 300 miles north of Tokyo, necessitating a rather early start and a long drive – made all the more difficult, incidentally, by our ill-judged decision to dally overlong at Yebisu’s in Nishi Ogikubo last night. But I digress. 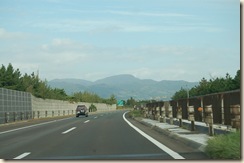 We arrived in Sendai City after a drive through some pretty spectacular scenery. The Kanda plain on which Tokyo sits is surrounded by mountains that rise suddenly and unexpectedly from the billiard-table flat countryside. It is an impressive landscape – perhaps due to its volcanic origins – quite unlike anything that I’ve seen in Europe; Steep mountains and deep valleys, all carpeted by dense forests. As we travelled north, the leaves became increasing tinged with gold and red – a tantalising preview of the spectacular display to be played out over the next few weeks. The city’s sports hall is quite an impressive facility, and by the time we arrived, the competition was in full-swing. 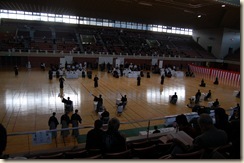 Unlike the Nationals in the UK, this competition appeared to be restricted to just 5th, 6th and 7th dan competitors. Consequently, the standard was – as you’d expect – pretty high. But what really surprised me was the number of very high grades there. In the UK, the highest grade we have is 7th dan and there is only a handful of them. Here, there are lots more, not to mention a surprisingly large number of 8th dans. I thought 8th dan was the highest possible, but apparently there are three 9th dans still alive and one of them gave a demonstration yesterday. Quite amazing – he must have been well into his 80s. There’s hope for me yet. I met with my new sensei and was introduced to some of the other students and given the official OK to commence training, although it will be sometime before I am given any form of direct tuition. I have to prove I am serous first – just goes to show the limited value of my 2nd dan grade! Along with the impressive Iaido,there were some pretty impressive toys on display yesterday. 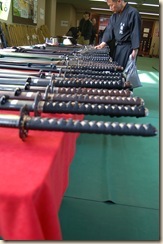 Each one of these swords is a shinken – a real, razor sharp sword forged in the traditional way by a certified swordsmith. And as you’d expect, each has a price tag to match. This selection started at about 65 man Yen – about £3,200. By for me – the highpoint of the day was the mass demonstration by 7th and 8th dans. 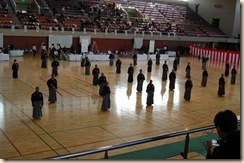 There were far too many great Iaido practitioners to take in in one go, but I did spot some fantastic techniques. Oshita sensei – perhaps the most important teacher for UK Iaido – was just below where we were sitting in the balcony, impressive as always. But just one of many, many other great displays.